Slide your hand into the pocket on this mug for a comfortable grip! Comes in right & left handed versions. 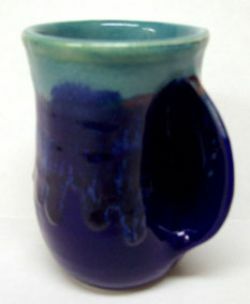 This unique mug is available in either a right or left handed version. Available in colors Mystic Waters (blue), Misty Green (green), Mossy Creek and Ocean Tide. This mug is microwave and dishwasher safe and is lead free. Size: 3.0 lbs., 6" x 3"